When I was a kid the sides of the road I lived on were gravel. I spent a lot of time looking at rocks as I went from one place to another in the neighborhood. Occasionally one of them would stand out from the rest. A different color or texture than most. I collected those special ones and kept them in a drawer in my bedroom. Now the gravel is gone, replaced with cement curbs up against the grass. My little collection is sitting in a box somewhere. The only remaining evidence of what was once a river of stones that flowed past my house. Biff’s got one hell of a Gray Thumb. Oh great, what will the theme be now? Rocks? Gardening? 70’s fads? The first non exercise cartoon in awhile. I sure hope Biff is wearing some sunscreen. He looks awfully pale and that sky is awfully blue, he’ll look like a lobster in no time. I loved how that sounds “The only remaining evidence of what was once a river of stones that flowed past my house”. I am shure I won’t forget that sentence in a while. Now I’m gonna go throw flowers at the lake. The caption made me facepalm and laugh at the same time. Also; the last sentence in your blurb sounds like it came from a poem. The last sentence is very poetic and deep sounding. I likes it. Reminds me of my rock collection that I had as a kid. I also only collected the special looking ones… the white crystally-looking ones and the ones with lots of micah. I kept it in my red plastic bucket in the garage… but then when we moved my parents dumped all of my glorious collection out in the woods without telling me… and it was gone just like that. I cried. I miss the innocence of being a kid sometimes. Just make sure his pet rock doesn’t dig up his rock garden! Being Biff, I can see these rocks growing in a later comic. good to know I wasn’t the only one who collected random pretty stones when they were a kid. I used to collect rocks too. My mom says that when I would come home from kindergarten I brought nearly the entire playground with me, and that my jacket pockets always had dirt in them from said rocks. We had ones that had tiny bits of copper and some really shiny mica in them in the plant beds outside my house, so I had about a million of those. A rock garden? Awesome. 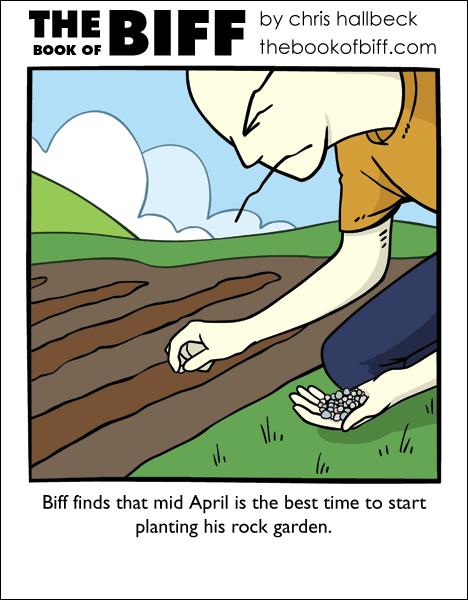 xD I wanna see rock flowers and veggies, too, Biff! This was a real groaner… still funny, but the pun is inescapable. @Dzelda: I don’t think Biff is stupid… I think he just sees things differently than everyone else does. Besides, he lives in a world where Giants and Monsters are real, so who’s to say rocks don’t actually grow there, too? is biff growing rock cocaine or rock sugar? Ah, but what if there’s a mid April frost? We never had gravel on the sides of the roads, but I do remember the neighborhood I lived in as a kid had a lot of houses with no sidewalk. It was one of those neighborhoods where the houses had been there for decades, I’m guessing before the invention of sidewalks, but whatever. We had these dips on the sides of the roads, you know, as archaic raingutters. My friends and I loved running around in them, especially the ones which were about 5 or six feet down. If you didn’t get enough momentum going down, you couldn’t get back up without help. I had a rock garden . . . they all died. “The only remaining evidence of what was once a river of stones that flowed past my house.” Reminds me of the line in 39′ “It’s been many decades but I’m older but a year” For some reason. Best way I know of growing boulder trees. Back in elementary school, I would find tiny shells in the rocks on our playground, which I collected. @ Seraphine: Biff doesnt seem like one to do crack. @ Trip Hazard: How can you tell? Poetic indeed. Reminds me of a recurring dream I have where the street by the house I lived in as a child is a river.